Gossip The Public Reacts As 47 year-old Malawian Mother Marries Her Son For This Shocking Reason! 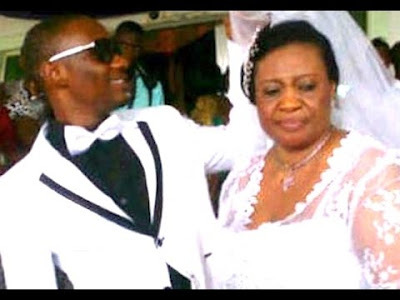 The Public Reacts As 47 year-old Malawian Mother Marries Her Son For This Shocking Reason! 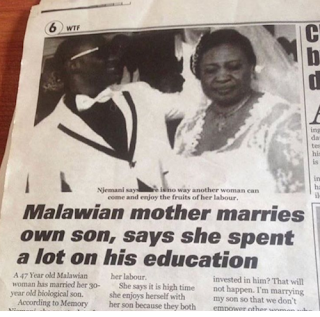 This has gone viral on social media, where a woman aged 47 married her own bilogical son whose age is 30, meanwhile both are from Malawi. The woman said that her reason was because she invested a lot in her son's life, especially in her son's education. The 47 year-old woman,whose name is Memory Njemani, says another woman can't marry her son after all her efforts and hard work in educating her son. Insisting that it's high time she enjoys herself,since they both worked hard. “I invested alot of money in the education of my son. Why should another woman be married to him and enjoy my hard work I invested in him? That will not happen. I’m marrying my son so that we don’t empower other women who have been aborting ” she said. Meanwhile society is rebuking the move charging that the woman is a witch and must be burnt to ashes. The public says she bewitched her son to marry her not the claims she is making. The two have since married and are staying together.